Economic diversification by establishing new business hubs and industries coupled with the development of water and waste water treatment plants across all the Middle Eastern countries would fuel the growth of industrial valves market during 2018-24. The development plans such as Saudi Vision 2030, Qatar National Vision 2030 and Dubai Vision 2021 would help in the setting up new industries in the region and would significantly spur the Middle East industrial valves market revenue in the near future. Additionally, due to heavy usage of valves in oil & gas facility and water & waste water treatment plants, these segments remain as the key market revenue shareholders in the overall industrial valves market in Middle East region in terms of application. Further, several Middle Eastern countries are facing water shortage and are using waste water reuse practices which in turn is expected to strengthen the dominance of these segments even more in the coming years. Some of the key players in the Middle East industrial valves market include - Flowserve, Emerson, Bray Control, Samson Control, Cameron, AVK, NSSL, Alfa Laval and others. The Middle East Industrial Valves Market report comprehensively covers the Market by functionality, On-Off valve types, Control valve types, applications and countries. 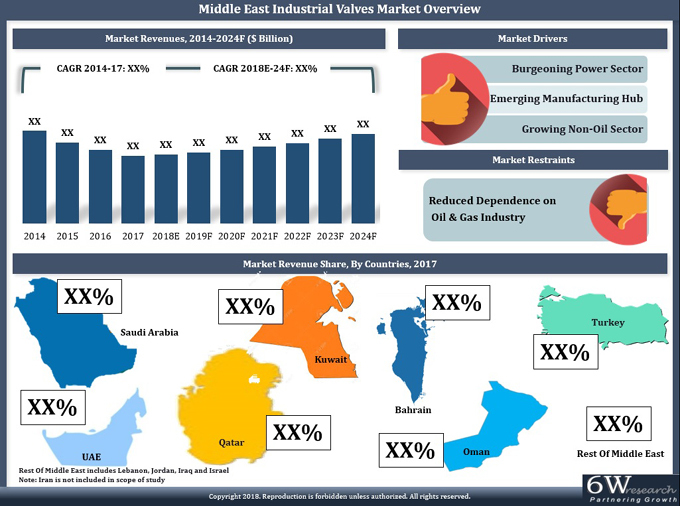 The Middle East Industrial Valves Market outlook report provides an unbiased and detailed analysis of the Middle East Industrial Valves market trends, opportunities, high growth areas and market drivers which would help the stakeholders to device and align their market strategies according to the current and future market dynamics.